Photo: Friends and family set up a makeshift memorial to victim Jordan Santos at the crime scene on Edsall Avenue. Forum Photo by Michael V. Cusenza. An Ozone Park girl this week was remanded into custody after she was charged with first-degree manslaughter for her alleged role in the shooting death of a man on a Glendale street early Sunday morning, according to authorities and published reports. Jordan Paulino, 17, was additionally arraigned Monday night on one count of second-degree hindering prosecution and one count of conspiracy in the fourth degree. Paulino was allegedly sitting in the passenger seat of Jordan Santos’s Lexus SUV when a gunman walked up on the driver’s side and opened fire, hitting Santos, 21, at least once in the neck. He later died at the hospital. 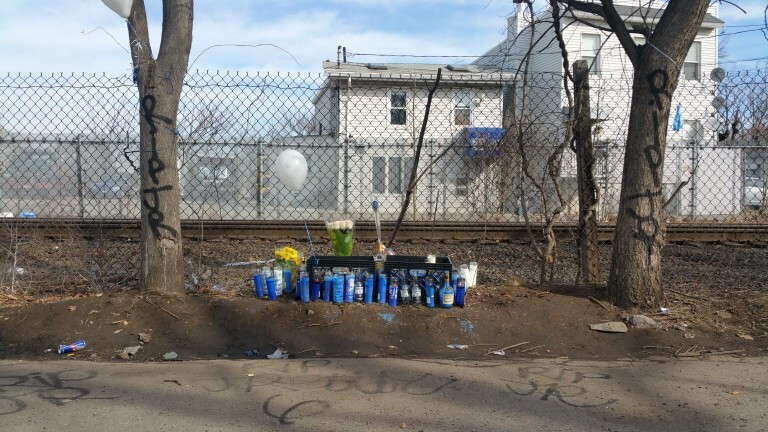 According to reports, Paulino allegedly lured Santos to the spot on Edsall Avenue, which runs parallel to freight-train tracks, where he was killed. Cops have not released a motive, and have not yet apprehended the shooter. Paulino is in protective custody Rikers Island until her next court appearance on April 6. According to the New York Daily News, Paulino has received death threats on social media since her arrest last Sunday.